The New York Times: Out of print in ten years? It isn’t anything particularly special to hear people talking about the declining market for print newspapers, and how market dynamics and demographic trends have put the traditional newspaper publishing model at risk. At the same time, most newspaper publications have found it quite challenging to “migrate” their print customers to paid-subscription digital platforms. The plethora of free news sites online makes it difficult to entice people to pay for digital access to the news – even if the quality of the “free” coverage is lower. 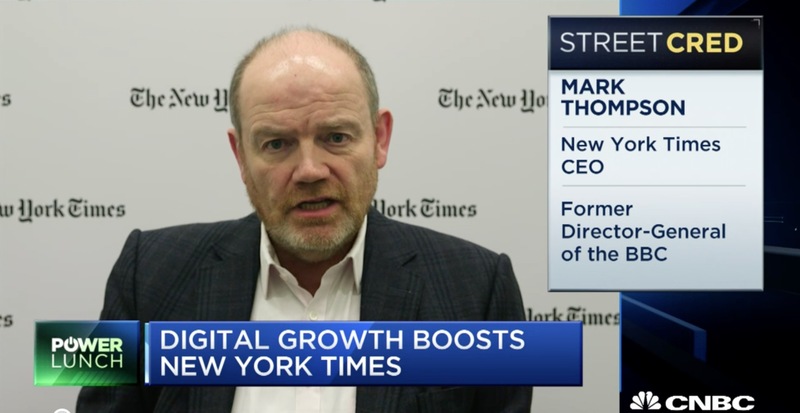 New York Times CEO Mark Thompson, appearing on CNBC’s Power Lunch program (February 12, 2018). But it was quite something to hear a forecast made by Mark Thompson, The New York Times’ CEO. 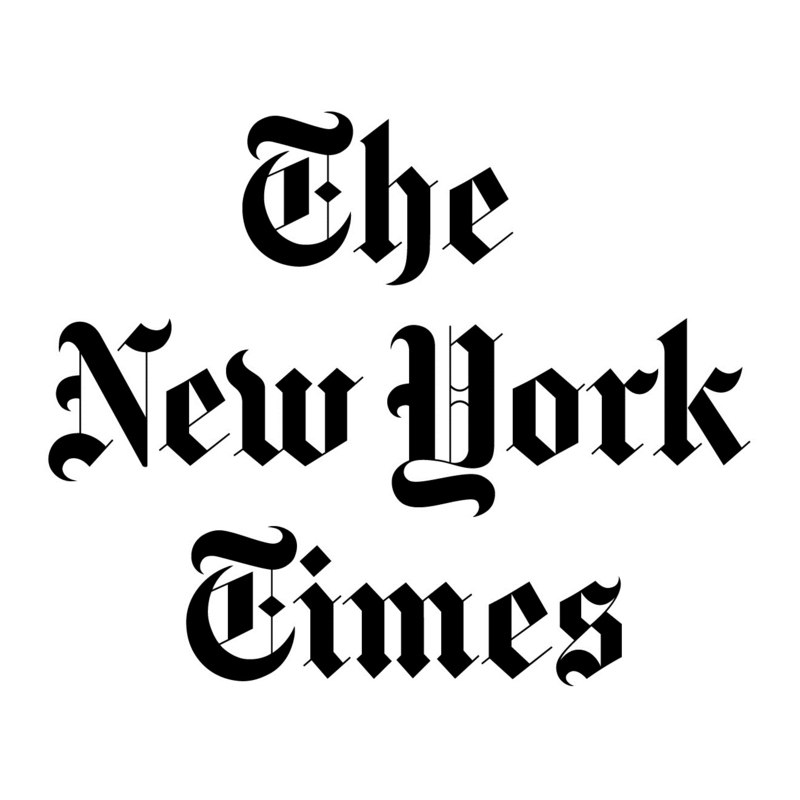 Earlier this month, Thompson made remarks during CNBC’s Power Lunch broadcast that amounted to a prediction that the NYT’s print edition won’t be around in another ten years. It’s one thing for newspapers in various cities across the country to be facing the eventuality of throwing in the towel on their print product. It’s quite another for a newspaper as vaunted as The New York Times to be candidly predicting this result happening. It would seem that the NYT, along with the Washington Post, The Wall Street Journal and possibly USA Today would be the four papers most able to preserve their print editions because of their business models (USA Today’s hotel distribution program) or simply because of their vaunted reputations as America’s only daily newspapers with anything approaching nationwide distribution. I guess this is what makes the Thompson remarks so eyebrow-raising. If there isn’t a long-term future for The New York Times when it comes to print, what does that say about the rest of the newspaper industry? “Hopeless” seems like the watchword. It will be interesting indeed if, a decade from now, we find no print newspapers being published in this country save for hyper-local news publications – the ones which rely on print subscribers seeing their friends and family in the paper for weddings, funerals, community activities, school sports and other such parochial (or vanity) purposes. Interesting … but a little depressing, too. Downsizing hits America’s most prestigious business media properties. 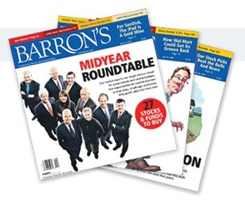 This past week, the business media world was buzzing about the inadvertent release of information concerning pending layoffs at Barron’s magazine, thanks to editor-in-chief Ed Finn mistakenly hitting “reply all” on a message intended for just one person. But the more interesting news is what’s happening right now with two of America’s most important national print publishing properties: Barron’s and The Wall Street Journal. Up until now, it was thought that a select handful of America’s largest and most pervasive publications with national reach and reputation would be the ones least susceptible to problems befalling the industry regarding declining advertising revenues and changing news consumption habits. At or near the top of the list of those rarefied properties were these two publications for sure. But now we know a different reality — or at least a more complicated one. WSJ editor-in-chief Gerard Baker announced last week that the publication is seeking a “substantial number” of employee buyouts to limit the extent of involuntary layoffs that will need to happen otherwise. The WSJ buyout offer been extended to all news employees worldwide – managerial and non-managerial – and includes a lucrative voluntary severance benefit that’s 1.5 times larger than the company’s standard buyout package. 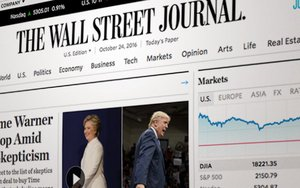 WSJ employees will need to make up their minds quickly, as the buyout offer is good only until the end of October. As for Barron’s, its situation became public only after the Ed Finn memo was received in the New York City newsroom of The Wall Street Journal in error. The Finn memo, which had been intended for Dow Jones Media Group publisher Almar Latour, speculates on how The Wall Street Journal’s announcement might affect an upcoming round of layoffs at Barron’s. That bit was “new news” to pretty much everyone. Aside from the “drama” of news scoops happening because of unintentional actions, the bigger question is this: What do these layoffs and buyouts portend? Is it the end of the adjustments – or just the beginning? Let’s see what kind of “silver bullet” business strategy they end up devising – and whether it will have its intended effect. When a business model becomes problematic, sometimes the only solution is to step outside the circle with some seriously radical thinking. That seems to be what magazine publisher Rodale has done with its flagship media property, Prevention magazine. As reported by Jeffrey Trachtenberg this past week in The Wall Street Journal, beginning with the July issue, Prevention will no longer accept print advertising. It’s a major step for a publication as venerable as Prevention, in print since 1950 and an important player in the magazine segment focusing on nutrition, fitness and weight loss. According to the Trachtenberg piece, Prevention magazine has actually seen an increase in ad pages – up over 8% to 700+ ad pages in 2015 over the year before. But here’s the rub: ad revenues were actually down because of circulation losses. 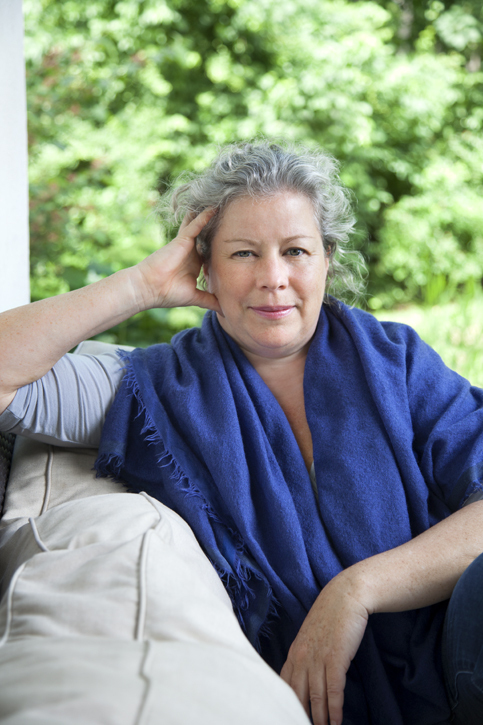 The magazine hasn’t turned a profit in a number of years, either, although other related Rodale titles have (Runner’s World and Men’s Health). The radical surgery planned for the publication means that the number of pages of a typical magazine issue will decline dramatically. So the cost of printing and shipping will go down. In order to make up for the loss in ad revenue, the magazine’s subscription price is set to more than double to nearly $50 per year. Price-conscious as consumers are, that action is expected to drive circulation figures down even further – from around 1.5 million to roughly 500,000 if the company’s projections are correct. Is this an ingenious idea that will preserve and strengthen a highly regarded publication? Or a desperate action that will end up simply driving this magazine into oblivion in a novel way? Rodale anticipates that Prevention magazine’s operating expenses will be reduced by more than 50%. … But I’m not so sure. This radical departure from the traditional ad-supported publication model may pay short-term dividends. But will it turn out to be merely a momentary respite before the next downward slide – this time into irrelevance? With so much information being so easily accessible online (and free of charge) – particularly in the areas of preventive health – I can easily envision fewer and fewer people wishing to shell out $50+ per year for the benefit of receiving a monthly publication that may or not contain highly relevant and valuable information each and every issue. What do you think? Is this a silver-bullet solution? Or a zinc zeppelin? Memo to newspaper publishers: Don’t ‘diss’ your print subscribers. A few weeks ago, the Boston Globe stubbed its toe in major fashion when it changed the company it uses to deliver ~115,000 hard-copy versions of the daily paper in the Boston metro area. And the problems continue to persist even now. No doubt, the decision to switch home delivery services was made out of a desire to save money rather than to improve service. And one can understand why management might have been looking for ways to cut production costs on the print version compared to the “go-go” online/digital realm. But focusing on solely millennials and other younger customers can come back to “bite you on the bottom line” – which is exactly what happened in the case of the Globe. Evidently, the new delivery service was untested – at least in terms of taking on a client with volumes as large as Boston’s leading newspaper. 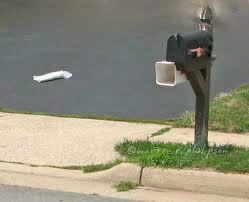 As it turned out, tens of thousands of papers weren’t delivered, sparking a cataclysm of loud, negative feedback. The pique of customers went well-beyond failing to receive something that had been paid for. 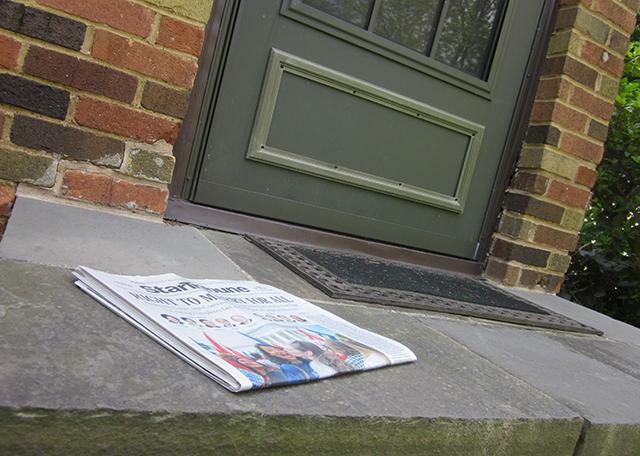 In the case of the Globe’s extensive Baby Boomer subscriber base, missing home delivery struck at the heart of the time-honored rituals of how they receive and consume their news. Consider this: The average subscriber to the Boston Globe pays around $700 per year for their home-delivery subscription. That’s more than $80 million per year in income for the paper – before factoring in advertising revenue. Of course, the costs of producing and delivering the print product exceeds that of digital. But this subscription base is more loyal than digital news consumers precisely because they value how the news is presented to them. Perhaps the Globe’s business and administrative staffers lost sight of that fact. Maybe they treated their “unsexy” print subscribers as an afterthought while forgetting that this segment of their customer base is critical to the very survival of their paper – and the industry – in a period of transition. True, delivering the news to print customers is more expensive than doing so digitally. But these customers are more predictable and loyal, versus fickle and finicky. … But only if the product is delivered. Fail in that fundamental function, and the gig is up. This isn’t to suggest that Boomer audiences are a bunch of rubes who aren’t connected to the digital world. Far from it: They tend to be better educated and more wealthy (with more disposable income) than other demographic segments. Their attachment to print isn’t in lieu of digital, but more in concert with their online habits. Unlike other generations, they’re not single-channel as much as omni-channel consumers. The keys to newspaper publishers’ continued relevance are bound up in how they serve this older but critically important segment of their customer base. Speaking personally, I can “take it or leave it” when it comes to print. I don’t subscribe to a daily print paper, and the bulk of my news comes to me from digital sources. But there’s something quite comfortable about sitting down with a quality daily paper and reading the news stories therein — including long-form journalism pieces that are difficult to find very many places these days. There are millions more people across the country that are happy to continue paying for the privilege of consuming the news in just such a fashion. Indeed, they’re the newspaper industry’s most loyal readers. Craigslist: The $5 billion juggernaut that crippled an industry. It’s common knowledge that the business model for newspapers started going awry in a major way with the decline in newspaper classified advertising. Craigslist played a huge role in that development, as the online classifieds site went about methodically entering one urban market after another across the United States. And now we have quantification of just how impactful Craigslist’s role was. It comes in the form of a May 2013 study authored by Robert Seamans of New York University’s Stern School of Business and Feng Zhu of the University of Southern California. Titled Responses to Entry in Multi-Sided Markets: The Impact of Craigslist on Local Newspapers, the study explored the dynamics at play over the period 2000-2007, focusing on newspapers’ degree of reliance on classifieds at the time of Craigslist’s entry into their markets. What the researchers found was that those newspapers that relied heavily on classified ads for revenue experienced more than a 20% decline in classified advertising rates following Craigslist’s entry into their markets. But that isn’t all: The outmigration of classified advertising to Craigslist was accompanied by other negative trend lines — an increase of subscription prices (up 3%+) and lowering circulation figures (down nearly 5%). 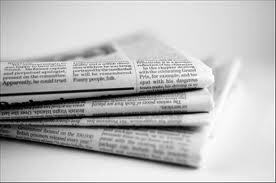 Even newspaper display advertising rates fell by approximately 3%. Were these developments “cause” or “effect”? The study’s authors posit that fewer classified ads may have diminished the incentive for people to purchase the newspapers. Also, display advertising rates tend to track circulation figures, so once the “decline cycle” started, it was bound to continue. The study concludes that by offering buyers and sellers a free classified ad alternative to paid listings in newspapers, Craigslist saved users approximately $5 billion over the seven-year period. Those dollars came right out of the hides of the newspapers, of course … and changed the print newspaper industry for good. But here’s the thing: The experience of the newspaper industry has relevance beyond just them. “The boundaries between media industries are blurred and advertisers are able to reach consumers through a variety of platforms such as TV, the Internet and mobile devices,” the authors write. The unmistakable message to others in the media is this: It could happen to you, too. A full summary of the Seamans/Zhu report can be found here. The news about newspaper readership rates has been uniformly bleak over the past decade or so. In fact, readership rates for daily print newspaper have declined almost 20% since 2001, according to trend studies conducted by market research firm Scarborough. Today, national daily print newspaper readership rates stand at around 37% of adults, down from ~50% just a dozen years ago. Interestingly however, there are distinct differences in readership rates based on geography. Readership appears to be highest in the Northeast and Industrial Midwest regions, whereas it’s significantly lower than the national average across the Southeast, Texas and the Pacific Southwest. 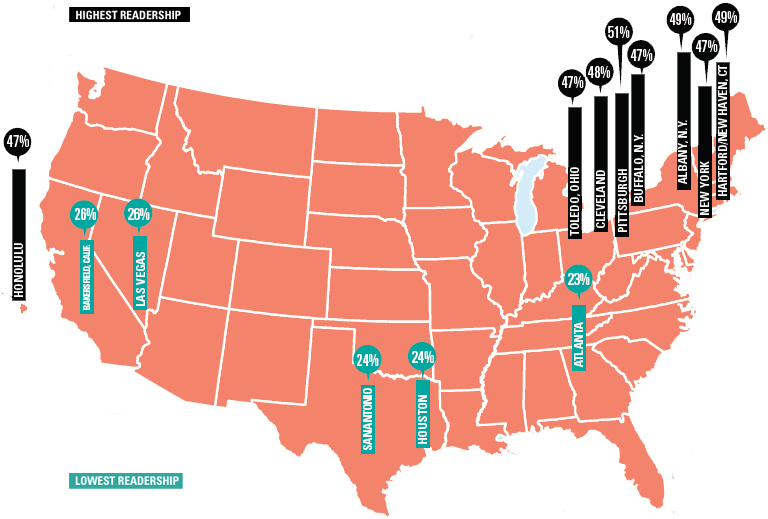 Which metropolitan market takes top honors for readership? It’s Pittsburgh, where ~51% of the adult population reads daily print newspapers. Only one other metropolitan market charts daily newspaper readership as high: Honolulu, at ~47% adult readership. What’s the cause of these geographic discrepancies? It may be age demographics, which tend to skew younger in these Sunbelt markets. Perhaps it’s the ethnic composition of the markets – although pretty much all of them on both lists have diverse populations. So I turn the question over to the readers: If you have any insights (or even simply suspicions) to share, I welcome your comments.